Over the years, I have found that little league umpires (baseball, soccer, football, doesn't matter) are extremely reluctant to call a game for weather no matter how dangerous conditions are. 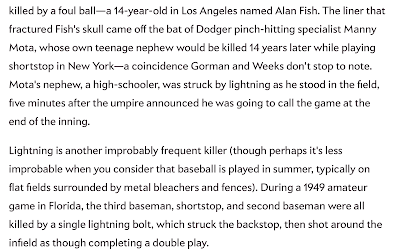 I remember getting into a shouting match with an umpire during son Brandon's little league game as extremely dangerous and frequent cloud-to-ground lightning was approaching and had gotten within three miles. Now, we have a video of a little league game continuing as tornado sirens sounded last week. That is no surprise to me. When the threat is major ("high" risk of tornadoes) or there is another substantial severe weather threat, and it is known eleven hours in advance, the games never should have been played. League officials should have called them off in plenty of time to notify players and parents. My experience is there is a macho thing going on. Umpires and referees don't want to look like wimps by calling the games due to weather. 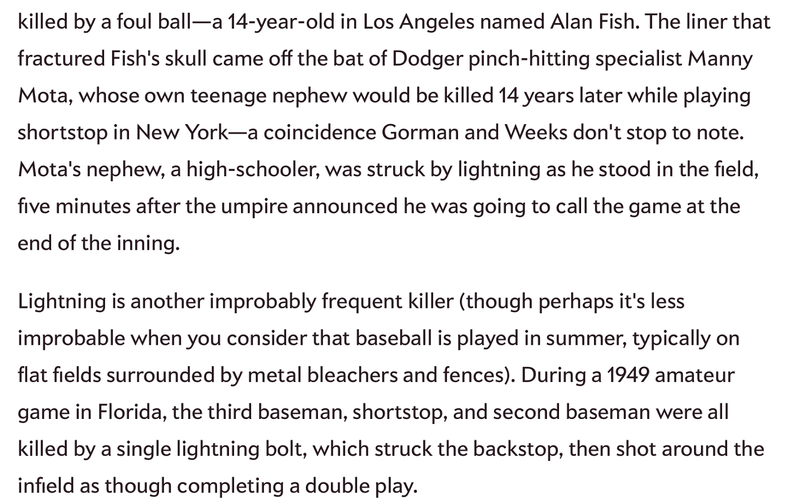 Yet, lightning has been known to cause multiple fatalities in a single game. Here is some lightning safety information from AccuWeather. NOAA has specific lightning safety information for Little League. Please take it to heart as we get into the heart of junior outdoor athletics. I remember one game my daughter played in that was miserable. Not stormy, but drizzle. They were the little ones, playing minors, and the parents asked for the game to be called after the 4th, but the coaches and umpires said no. We all caught chills that day. Baseball is fun, but it's not fun when you can't get warm, your kid is playing shortstop and sliding on wet ground to get grounders. Since we didn't have the wild weather the midwest gets (on the coast in CA) we do get good old Coastal Eddy and his cousin Fog. ... and then, there is Six Flags Over Texas operating their new "Joker" thrill ride with thunderstorm in immediate vicinity. Their "safety" systems stopped the ride ... with passengers trapped 12 stories up for hours. Maybe Accuweather should contact management there.